Determination of the ROI of online training is a hot topic today. 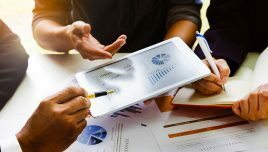 In this article, I outline a popular ROI methodology (using Kirkpatrick’s model of evaluation), and 5 tips that you can use to maximize ROI in corporate training. What Is Return On Investment (ROI) In Corporate Training? In general terms, Return on Investment (ROI) is the gain divided by the cost. In the same way, ROI in corporate training is the gain on account of the impact of the training divided by the training cost. 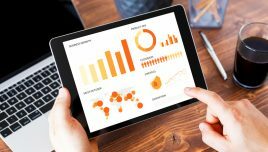 “ROI measures should be related to performance after the L&D experience and, according to some, tied to a dollar figure. For example, time saved or increased output (or both) as a result of improved performance following participation in a development program can then be compared to a dollar figure”. 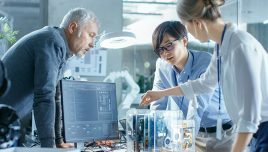 To establish a positive ROI, the training initiative should be able to show a demonstrable gain more than the investment made. While, the definition of ROI in corporate training sounds simple enough, measuring this is can be a tall order. 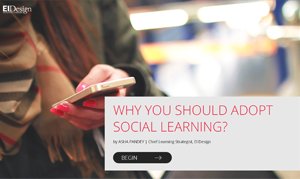 The value is the demonstrable gain for the learners and the organization. This is difficult to measure. At EI Design, we have been working with the L&D teams across the world for over 16 years now. During this journey, we have used several approaches that you can implement to maximize the ROI of online training. Before outlining these approaches, let us look at one of the popular ROI methodologies. Which ROI Methodology Can Be Used? 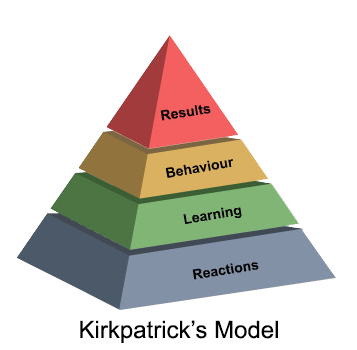 Most of us are familiar with the Kirkpatrick’s model of evaluation. In today’s context, adding Phillips’ ROI calculation as the fifth level makes this framework more useful and relevant. After establishing the gain through the 4 levels of Kirkpatrick’s model of evaluation, we can monetize it (that is, associate a monetary value to it). 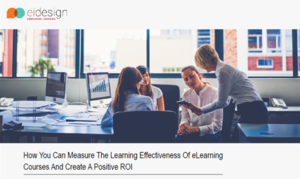 When we compare this with the eLearning development and the associated costs, we can assess if there is a positive or negative ROI of online training. This level relates to the learner’s reaction and satisfaction. 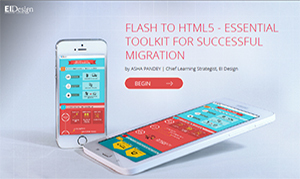 To obtain the learner’s feedback, we add surveys in the eLearning course. Today, we have the flexibility to also add other aspects that indicate a learner’s reaction by asking them if they “like the course” or would they “recommend the course”. The classic approach to measuring what the learners learned (validate against the expected takeaways) is through summative assessments (at the end of the course). This crucial aspect is certainly more difficult to measure. However, going back to the pointers collated during the Training Needs Analysis (TNA) provides the cues to assess if there has been a clear and demonstrable gain or not. This gain should be directly attributable to the online training. We need to drill down through the TNA pointers to establish what desirable change or gain should be established. This would certainly have some tangible and some intangible gains. Both should be captured. Then, we need to ascertain, how this gain/change will be measured (over a stipulated period). We also need to identify if we need to add Performance Support Tools or learning aids to support the formal training (to help learners apply their learning and practice to move to the desired levels of proficiency or mastery). As an extension to the exercise for Level 2 and 3, we now need to identify how will the desired business impact be measured. 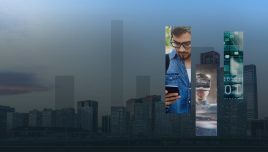 When you convert the business impact to a monetary value, you can use it to compare against the costs incurred and arrive at the ROI of online training. 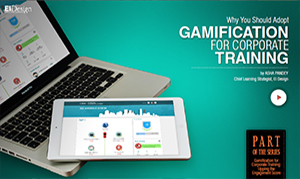 Now, I will share 5 tips that you can use to maximize the ROI of online training. You will note that each of these tips influences different levels of the Kirkpatrick’s model of evaluation. These measures are easy to implement and will also enable you to assess the impact of each measure from Level 1 to Level 4 (of the Kirkpatrick model). The entire exercise begins with the TNA where the current and desired competency mapping is done, and the expected learning gains or outcomes are identified. For instance, the program should obtain a 4.5/5 rating on relevancy from the learners. For instance, the learners should score 80% on the quiz. For instance, with the new skill, there should be a 90% increase in the productivity. For instance, with the new skill, there should be a 50% drop in the review time leading to a quicker completion of the project. For instance, the training investment should get offset by reduced review costs over one year. 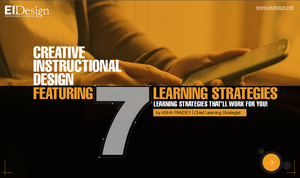 To fill the gap or aid the learner in picking up the required proficiency, the focus should now shift to the adoption of the right learning strategy. In the process, do look at establishing “learning as a continuum” and have an adequate blend of formal and informal learning. Today, you are spoilt for choice on various immersive approaches that you can pick from and which can create “sticky learning” you desire. Notable among these are the following and when applied right they will help you meet your mandate. You can use assessments in interesting formats (for instance, using scenarios or gamified quizzes). You can also use informal learning approaches to push challenges (quizzes) that the learners can use to validate their knowledge or practice. The focus should be not only on the rating post the online training program but over an extended period to assess if the proficiency levels are being sustained and/or if you can push it to the next level. Both during the development of online training as well as post-deployment, opt for a Litmus test, that is, obtain the learner’s feedback and check for continuous improvement to maximize the gain. What is the learner’s reaction? Are the supporting aspects that can facilitate application of learning in place (Performance Support Tools or learning aids)? Is there a room for reinforcement and remediation? Is there a provision for constructive feedback to the learners on their performance? To summarize, the task of determining ROI of online training is a complex one. I hope this article provides some practical insights and tips that you can use to create a positive impact on ROI. If you have any queries, do contact me at apandey@eidesign.net. 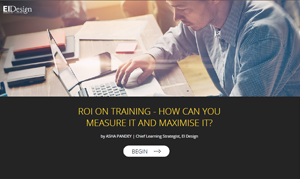 How To Measure The ROI Of Online Training? 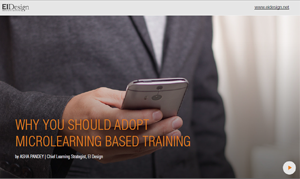 Free eBook: ROI on Training – How Can You Measure It And Maximize It?